In the last issue of the Solar Cooker Review, Barbara Knudson was quoted as saying, "Solar Cookers are more apt to be adopted when people are desperate, but do we have to wait until the whole world is desperate before we adopt this?" This important question calls for another one: What could we do to make solar cookers more convenient without making them too much more complicated? 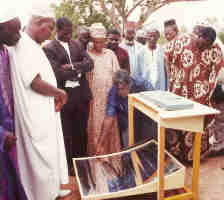 The Nelpa solar panel cooker presented here grew out of an attempt to answer these questions. It might be useful to understand how this new panel cooker relates to my original Solar Panel Cooker (SPC) and Solar Cookers International's (SCI) derivative, the CooKit panel cooker. Figure one shows the SPC without its optional front panel. It consists of four panels with a inverted clear glass salad bowl resting over the cooking pot on the bottom horizontal panel. As SCI has shown, a plastic bag can be used in place of the glass bowl with very good results. Now imaging that we turn the entire assembly upside down so that the bottom panel is now on top (hence the name "Nelpa" which is a sort of an inverted form of "panel"). As you can see, I have cut a hole in this panel, allowing the pot to be inserted from above. I have placed a reflector below to bounce the light rays into the inverted panel assembly. Since the pot lid is outside of the glazing, the food remains perfectly accessible to the cook for tasting, seasoning, stirring, etc. For the same reason, the steam emitted by the heated food does not condense on the inside of the glass or plastic. The salad bowl (or plastic bag) is mounted permanently in place, so there is no need for cleaning or drying and little chance of damage. The suns rays hit directly on the pot's sides and bottom which are in contact with the food. This direct contact is more efficient than heating the pot lid, which is often the case with other designs. The horizontal panel can be enlarged if necessary to act as a table for food preparation. A fraction of the sunlight is lost by its having to reflect off the bottom panel to reach the panel assembly. No surface is 100% reflective. Some heat escapes from the un-insulated lid and along with steam that escapes from it. The whole design is a bit more complicated and requires more frequent adjustment to follow the sun. Figure 1 shows nine-year old Amélie cooking lentils with a Nelpa cooker. It is equipped with a three-mirror reflector whose wooden frame is attached to the front legs of the cooker by two bolts. It can be tilted according to the altitude of the sun. It is balanced to remain in any chosen position. The best angle between the central panel and the side panels depends on the diameter of the pot and its distance from the central panel. This can be adjusted by sight by moving the side panels until a reflection of the pot is seen in each one. It may be noted that effectiveness of this design declines as the sun reaches 90º since the top panel tends to shade the bottom reflector at high sun angles. This should not be too inconvenient since in temperate latitudes the sun never reaches this height, while in the tropics cooking would usually be completed in the morning before the sun gets too high. And of course cooking could continue in the afternoon. After cooking is finished the Nelpa can be collapsed by flipping up the reflector. His prototype, built with foiled cardboard panels and mirrors, weighs six kilograms (about 13 lb.) and is not much more cumbersome than a suitcase. In summary, simple and cheap panel cookers like the SPC and the CooKit remain the best for emergencies and mass diffusion, but people who can afford a more elaborate cooking device might prefer the Nelpa for its convenience.